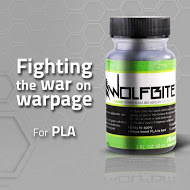 Costa Mesa, Calif. – Airwolf 3D today Wolfbite Nano, a premium solution specifically engineered to bond polylactic acid (PLA) plastic parts to a glass 3D printer build plate without lifting—also known in the industry as “warpage,”—and to enable smooth release of objects after printing. This new solution works well with heated and non-heated beds on all types and brands of the 3D printers utilizing glass printing surfaces. PLA is the most preferred material for 3D printing because of its low heat shrinkage, biodegradability and widespread availability. However, PLA must be printed on a prepared surface for correct adhesion. A common surface treatment includes applying blue or red “painter’s” tape to a glass plate. After use, the paper tape may become damaged or require replacement. Other issues associated with printing on painter’s tape is difficulty in removing parts after prints and warpage from insufficient adhesion. Airwolf’s new solution addresses all these issues. WolfBite Nano is applied with an applicator brush straight onto glass, eliminating the need for tape. After applying Wolfbite Nano directly on glass, printing can commence immediately, either with a heated or room-temperature bed. Airwolf 3D specially formulated the proprietary solution to not only promote excellent adhesion but also to make part removal easy. Parts may be removed post print by immersing the glass plate in water for a short period of time, if necessary. “As manufacturers of 3D printers that are capable of printing large parts in PLA, we are aware of the frustrations with painter’s tape and adhesion,” said Wolf. “After months of research and development, we are pleased to offer a solution that will benefit nearly all desktop 3D printer users. This is a new, environmentally friendly solution for resolving the acute problem of PLA-based 3D printing, part adhesion and warpage. The solution is based on a combination of green chemistry and nanotechnology to create the best possible adhesion using compounds which are generally regarded as safe. Wolfbite Nano is packaged in a two fluid ounce container and comes with a foam brush applicator. It is currently available for sale on the Airwolf website at an introductory price of $19.99. Airwolf 3D will be demonstrating Wolfbite Nano at the Annual CUE Conference 2015, the largest education technology conference in California. Airwolf 3D will be in booth #461 during the 2015 CUE Conference at the Palm Springs Convention Center from March 19th through March 21st. Airwolf 3D is committed to manufacturing high-performance consumables, accessories and 3D printers that are fast, affordable, durable and easy to use. All 3D printers are made in America, manufactured in the company’s 12,000 sq. ft. facility in Costa Mesa, Calif. Currently, Airwolf 3D printers can be found in engineering firms, government agencies and schools worldwide. For more information visit https://www.airwolf3d.com, telephone (949) 478-2933, email info@airwolf3d.com, or visit the company’s showroom at 130 McCormick, Suite 106, Costa Mesa, CA 92626.